Description: OpenSS7 SIGTRAN Stack Design Documentation. The figure below provides a map to the interface specifications and componetns of the SS7 over IP stack. Click on an interface or a component to see the reference specification and design information related to the component or interface. 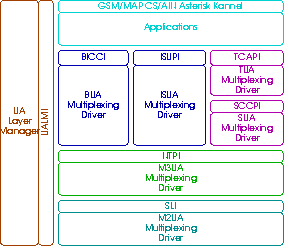 Note that the M2PA (SS7 MTP2-User Peer-to-peer Adataption Layer) is considered as a pseudo device driver. For more information on M2PA design see "SS7 Device Design." With the exception of the SDLI and SDTI (which are driver level interfaces for the SS7 Stack), the SIGTRAN stack uses the same set of interface specifications which are used by SS7 components in the OpenSS7 stack. This permits SIGTRAN UA components to be placed between SS7 stack components without the knowledge of either the upper or lower components. SS7 modules and application run as they would in a stand-alone SS7 stack.